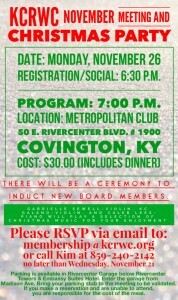 Registration begins at 6:00 PM, and the program will begin at 6:30 PM at Braxton Brewery at 27 W. 7th Street in Covington! Please wear red to support women’s health and you will be entered to win a prize. Additionally, bring a friend and you will be entered into the centerpiece give away. The cost of the event is $15.00. This cost will include heavy hors d’oeuvres. There will also be a cash bar available. 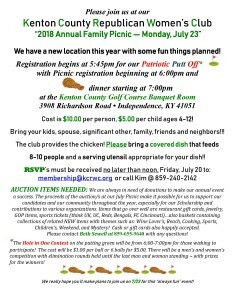 Please RSVP, via e-mail to: membership@kcrwc.org. You may also text Cindy at (502) 500-7003. Facebook RSVP’s do not count as an official RSVP. Comments Off on Join the KCRWC at Braxton Brewery on Feb. 25th with special guest Dr. Michael Gerwe! or on the website under Membership! 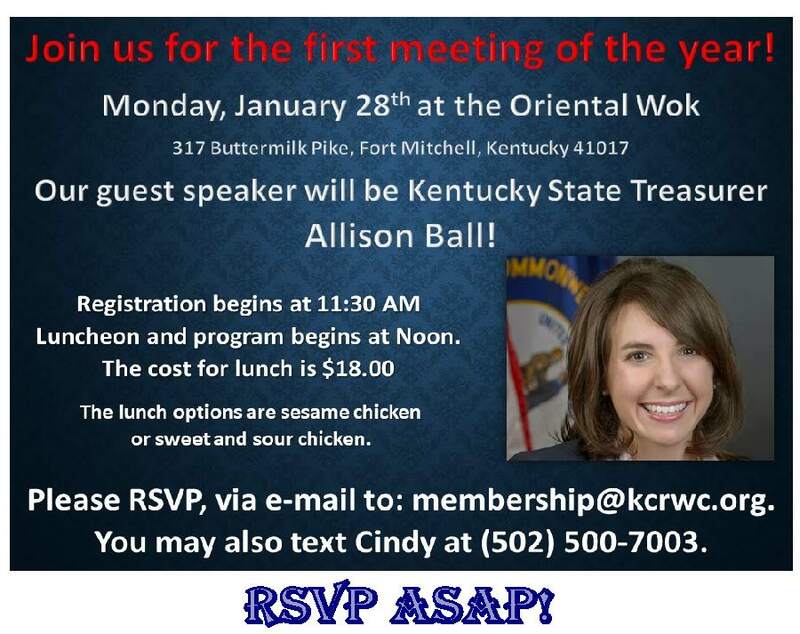 Comments Off on January 28, 2019 KCRWC meeting with KY Treasurer Allison Ball as guest speaker! 6:30pm social and 7:00pm for the dinner program until 9:30pm. Please join us on November 26th! Comments Off on Christmas Party 2018 – November 26th! 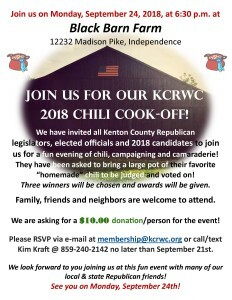 Comments Off on 2018 KCRWC Chili Cook-off! Join us! We have a new location this year with some fun things planned! Cost is $10.00 per person, $5.00 per child ages 4-12! Bring your kids, spouse, significant other, family, friends and neighbors!!! The club provides the chicken! Please bring a covered dish that feeds 8-10 people and a serving utensil appropriate for your dish!! AUCTION ITEMS NEEDED: We are always in need of donations to make our annual event a success. 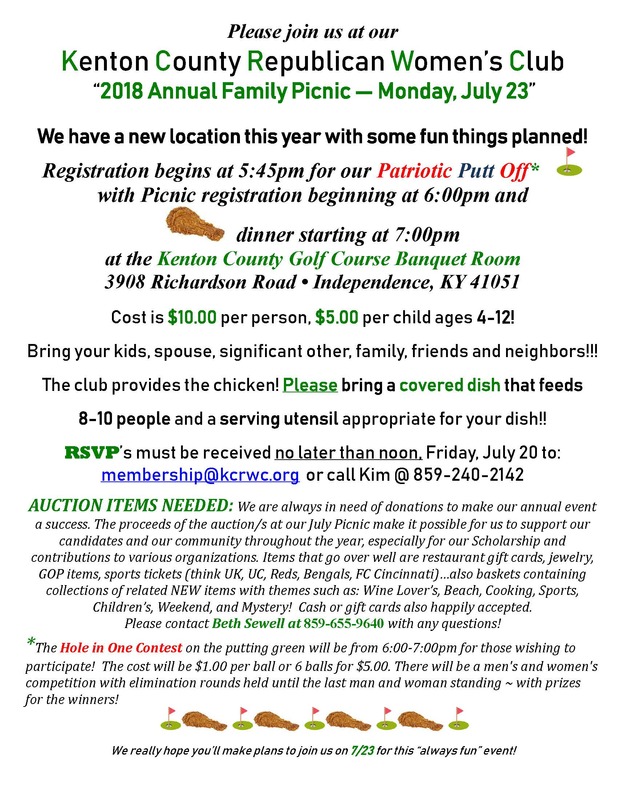 The proceeds of the auction/s at our July Picnic make it possible for us to support our candidates and our community throughout the year, especially for our Scholarship and contributions to various organizations. Items that go over well are restaurant gift cards, jewelry, GOP items, sports tickets (think UK, UC, Reds, Bengals, FC Cincinnati)…also baskets containing collections of related NEW items with themes such as: Wine Lover’s, Beach, Cooking, Sports, Children’s, Weekend, and Mystery! Cash or gift cards also happily accepted. 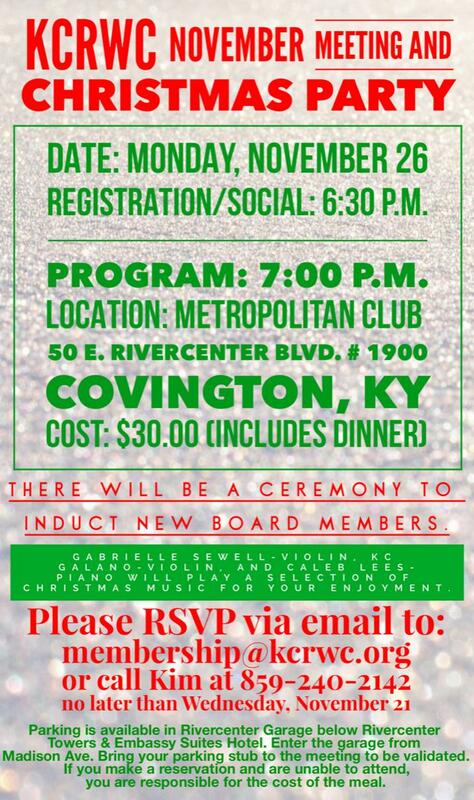 Please contact Beth Sewell at 859-655-9640 with any questions! *The Hole in One Contest on the putting green will be from 6:00-7:00pm for those wishing to participate! The cost will be $1.00 per ball or 6 balls for $5.00. There will be a men’s and women’s competition with elimination rounds held until the last man and woman standing ~ with prizes for the winners! We really hope you’ll make plans to join us on 7/23 for this “always fun” event! 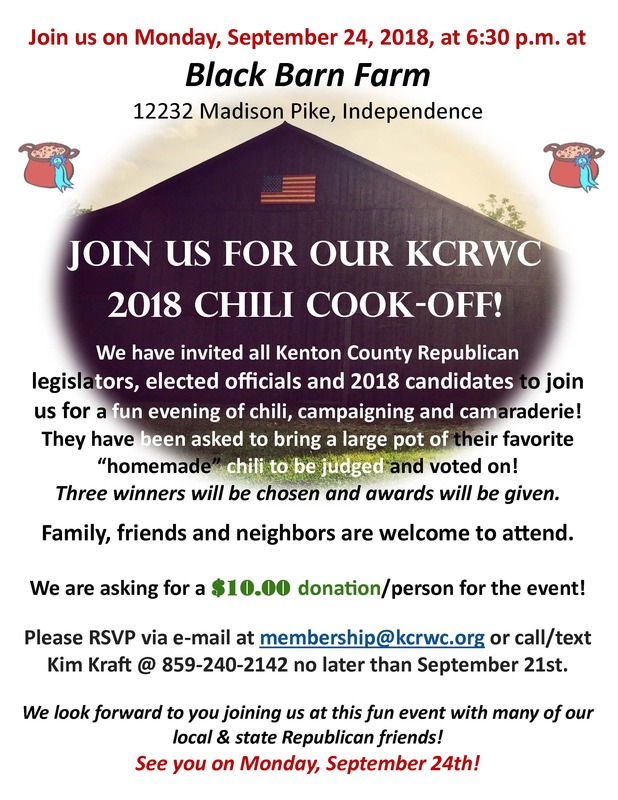 Comments Off on Pancakes, Pickin’ and Politics – Annual KCRWC & NKYR Pancake Breakfast! Comments Off on KCRWC panel discussion on the Opioid Crisis in our area will on Monday, March 26th! Please join us on Monday, February 26, 2018 at our new meeting location, The Metropolitan Club. The Metropolitan Club is located at 50 East Rivercenter Blvd, 19th Floor, Covington, KY. Registration begins at 11:30 a.m., with the program beginning at 12 noon. The registration table WILL NOT be open before 11:30am! Our guest speaker this month is Trey Grayson. Trey was the Kentucky Secretary of State from 2004-2011 and a candidate in the 2010 Republican Primary for US Senate. Recently the Washington Post wrote an article about Trey and why that 2010 Republican Primary is still politically relevant today. Come hear Trey speak about the article and catch up with him on what he has been doing since his Secretary of State days. Trey is a very interesting and engaging speaker so be sure to make your reservation and join us at the Met Club! Cost for the meeting is $18.00. Lunch will consist of a tossed garden salad with choice of two dressings, roasted red potatoes, vegetable medley, chef’s selection of two entrees, warm rolls and butter, mini pastry display and coffee, tea or water to drink. Lunch may be paid for with cash or check upon arrival. PLEASE R.S.V.P. 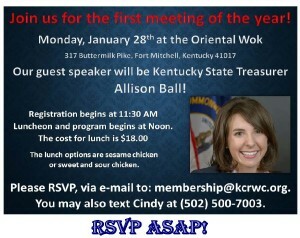 via e-mail to: membership@kcrwc.org or call Kim @ 859-240-2142 NO LATER THAN Wednesday, February 21st. If you make a reservation and are unable to attend, you are responsible for the cost of the meal. A reservation MADE is a reservation PAID. If you cannot attend and do not let us know by 3:00 P.M. the Friday (2/23/18) before the meeting, you will be invoiced for the cost of your meal. REMEMBER THAT CLICKING “GOING” ON FACEBOOK DOES NOT MEAN YOU HAVE AN ACTUAL RESERVATION. ONLY ONES EMAILED OR CALLED IN ARE ACCEPTED! PARKING: Parking is available in the Rivercenter Garage located directly below the Rivercenter Towers & the Embassy Suites Hotel. Entrance to the garage is located off of Madison Ave., just north of the Rivercenter Blvd intersection (between the Embassy Suites & the Marriott). Once in the garage follow The Metropolitan Club signs to the elevator. If you bring your parking stub to the meeting from the Rivercenter Garage, it will be validated for you.